Tuna are one of the largest, most wondrous fish in our oceans. They are able to accelerate faster than a sports car, can dive 250m in less that one minute, and when allowed to live out their lives, can grow up to 700 kilos! However we are rapidly ripping them out of our oceans and causing havoc while we do so. There has been much press in recent years about the global problem, yet it blows my mind we continue to perpetuate the issue by consuming such vast quantities. These are the "kings of the oceans" and are like the big cats of the land, whom we know are also endangered. We do what we can to protect the big cats and we certainly do not support industry that takes their lives. Yet why is it we turn a blind eye with the tuna and are continuing to eat them at a rate that is going to see these amazing animals disappear? I ask, why do we fight for the lions and tigers, the dolphins and whales, yet happily tuck into an endangered, tuna sashimi? Rampant overfishing due to our high demand for tuna, means that these incredible creatures are now extremely threatened and some species even critically endangered, with Bluefin tuna at the brink of extinction, down to only 3% of its historical levels. Australian Professor Glenn Hurry, who heads fishery management in the Western and Central Pacific said Bluefin and Big-eye tuna should no longer be fished, as stocks were dangerously depleted and warned an international agreement is urgently needed to avert disaster for the tuna industry. Yet the alarm bells are not slowing down the rate we are fishing them, with around 2.6 million tonnes of tuna caught in the Western Pacific Ocean and 800,000 tonnes in the Indian Ocean each year. The most populated species of tuna, the Skipjack, which is also the most fished, is sadly largely used as feed for our domesticated cats as pet food. Surely this is a loud cry for us to urgently stop taking these fish from the oceans and allow them time to replenish?! If the loss of the tuna is not a vital enough message for us to do something, then maybe the wasteful and damaging massive by-catch is. The incidental species they do not mean to catch, includes others species of fish, 100 million sharks a year and tens of thousands of turtles and rays, that are most often just thrown back into the ocean, dead. The reason for this is the way tuna is caught- by Purse Seines, gigantic nets that scoop up anything in its reach and its often done using Fish Aggregating Devices (FAD's), used to attract tuna and the other marine life in. While the Australian Tuna Industry has got behind not using FAD's in our waters and have committed to removing FAD's from their supply chains by the end of 2015, they are still used around the world. Especially in the Indian Ocean, where 90% of tuna is now caught using FAD's. Considering 72% of Australian seafood is imported, it is certainly something we must take into consideration. Watch the quick video below to get a visual insight to what this means! 1. Choose not to eat tuna at all. 2. Choose not to eat endangered tuna and less of the "sustainably caught" tuna. For a wider, interesting look at the fishing industry, I highly recommend you watch What's the catch? and support Mathew Evens campaign "Label My Fish" calling for the following labels to be mandatory, to help the consumer make sustainable choices. Clearer labelling laws are needed, especially with canned tuna - Australian's buy over 250 million cans per year. Currently the labels must show where it is packed but not how it is caught or where. Many companies have started to do so voluntarily but keep in mind the "Dolphin friendly" tag has been called next to meaningless because dolphins do not swim with many species of tuna in the Western Pacific and Indian Ocean, apparently only in the Eastern Pacific. So even though you may think you are doing the right thing by saving the dolphins, which of course we want to do, there are still turtles, whales and sharks being caught up with your tuna. Personally I would avoid canned tuna completely and only buy the fresh tuna, which can be guaranteed line and pole caught, but if you do eat canned tuna, Greenpeace has come up with a guide. 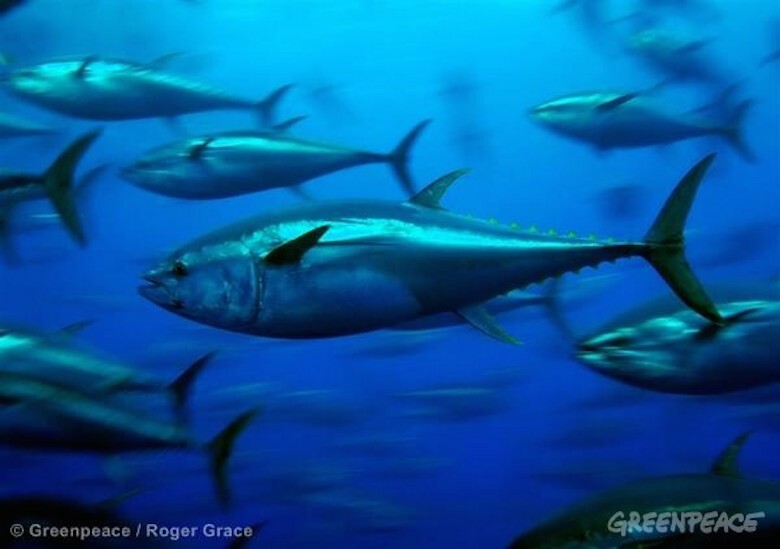 Greenpeace is calling for ocean sanctuaries to be created to defend breeding and spawning grounds, to protect the tuna that is left and allow them to replenish. I encourage you to sign their campaign and write to your MP and vocalise your support for this important initiative. WE NEED MARINE RESERVES TODAY.